We’re all becoming used to seeing great HD images on our TVs these days, so more than ever before, home CCTV can be pretty jarring to look at. With this in mind we started to investigate the HD IP camera world. It’s a new name to us, but the Lilin LR7424 Day & Night 1080P HD Vari-Focal IR IP Camera seemed to fit all our requirements – 1080p HD, PoE, IR Illumination and outdoor housing (IP66) with bracket included. Installing the Camera – The first thing we noticed taking the camera from it’s box is the quality of construction. The housing and bracket are metal, substantial and sturdy. 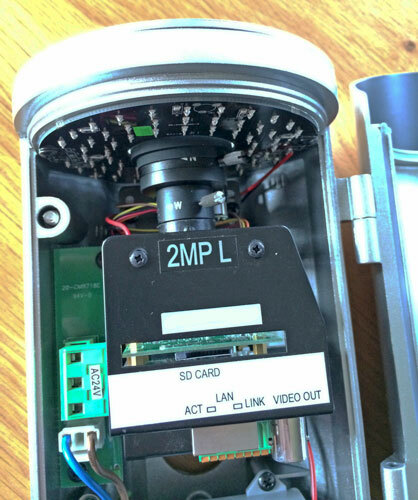 It’s a bigger unit than our other IP cameras, although not as big as the one we have in the traditional type external housing with heater – dimensions 121.5mm(W) x 109mm(H) x 231mm(D). Also in the box is an instruction manual, the LILIN CMX recording software CD and an L-type hex key wrench for the bracket. Time to get it on the wall. 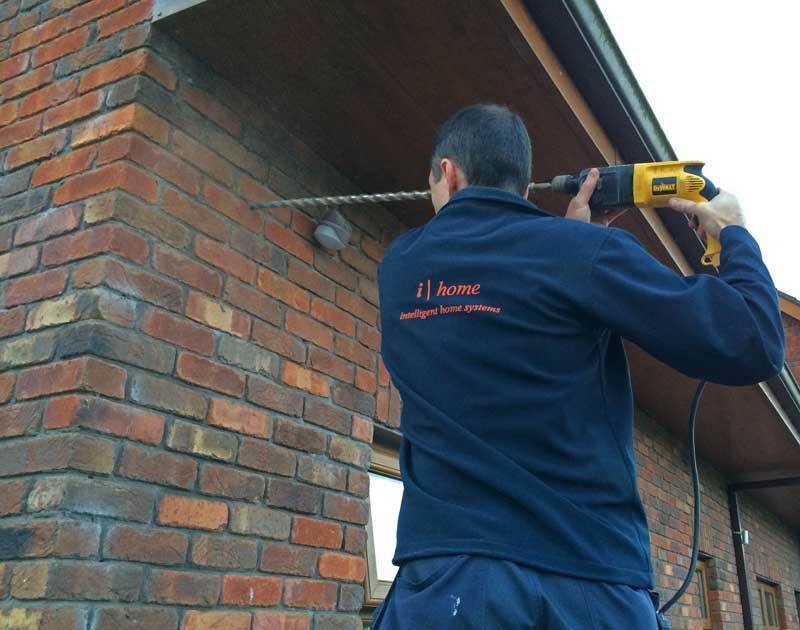 Our friends at i-Home brought their awesome selection of SDS drill bits and got through our cavity wall in no time. The screws that came with the camera were too short and Stephen recommended we use stainless steel ones anyway. The clever bracket allows you to pass your cables straight through its hollow body and into the camera. In our case we’d gone for the Power over Ethernet option (PoE+ IEEE 802.3at) and our PoE switch supplies up to 8 cameras. All this means just a single CAT5 cable is needed to provide both the data and power connections. There’s a rubber gasket that goes between the camera body and bracket to help keep moisture out. Stephen told us the biggest single issue they see with outdoor cameras in keeping them clean, with spider webs being the biggest single cause of problems. There are some anti-spider sprays on the market now that may help reduce this. 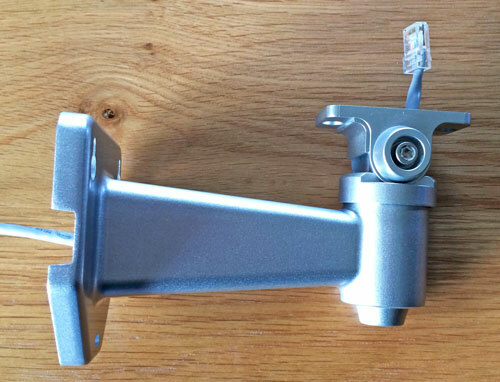 The camera ‘clicks’ round on its ratchet style toothed bracket before locking off with the included allen key. While this helps to ensure the camera won’t move it could potentially rule out that perfect angle where it falls between clicks. But we’re nitpicking, the mounting system is excellent. Viewing – We initially had a problem viewing the camera on our Macs, but flashing to the latest firmware solved this. We found an undocumented URL – /safari.html – that offers a more basic and compatible view (default login of admin:pass). The camera includes all the usual features you’ve come to expect from an IP camera including ONVIF support and the ability to FTP and email images based on movement. The hardware supports audio too but you need to bring your own microphone as there isn’t one built in. You can use audio as well as video for an alarm trigger. You can choose between 3.3 ~ 12mm fixed lens (horizontal viewing angle: 79.3 ~ 29.8° iris: F1.4) and 9 ~ 22mm fixed lens (horizontal viewing angle: 29.5 ~ 12.4° iris: F1.4). The image quality is very impressive and it immediately made the rest of our IP camera look very poor in comparison. Obviously the larger resolution video stream means you’ll need decent up bandwidth to get an acceptable frame rate for viewing the camera away from home. Performance at night (when the camera switches automatically to black and white) is impressive with the built in IR LEDs around the lens throwing illumination up to 35 metres. We use our trusty Synology 1813+ with it’s built in CCTV recording capability to capture streams from all our IP cameras. 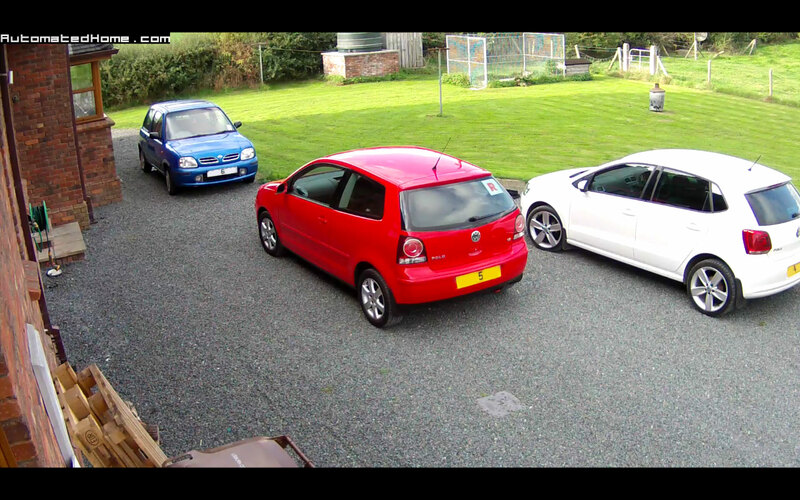 Check out the day time sample below to give you an idea of the detail in an HD CCTV image – click for large version. Summing Up – We’ve installed many IP CCTV cameras around the Automated Home over the years and the Lilin LR7424 is undoubtedly the best we’ve ever fitted. And while that quality is reflected in its price (around £400), the features it offers mean it represents value for money. Its little brother is available for around £200 and retains the majority of the features (with a shorter IR illumination distance and a few other differences). I guess the best recommendation we can give it is that we’ll be ordering and installing another Linin HD camera to fit at the Automated Home soon. 3 Comments on "Review: Lilin LR7424 1080p HD IP CCTV Camera"
I would love to purchase this camera, which does appear to provide everything that I want. However, you mention in the article that the camera works with a Synology Diskstation CCTV System even though on the Synology website, the Camera is not listed as compatible.